Reserve your VIP cabana today! Turn your beach getaway up a notch with a private cabana! Invite your family and friends to a unique, VIP experience at The SandBox at RumFish Beach Resort on St. Pete Beach. Each cabana has flowing curtains and high-definition entertainment - both on screen (TV) and off (live entertainment) - with magnificent views of your favorite beach and just steps from the sparkling beachfront pool. 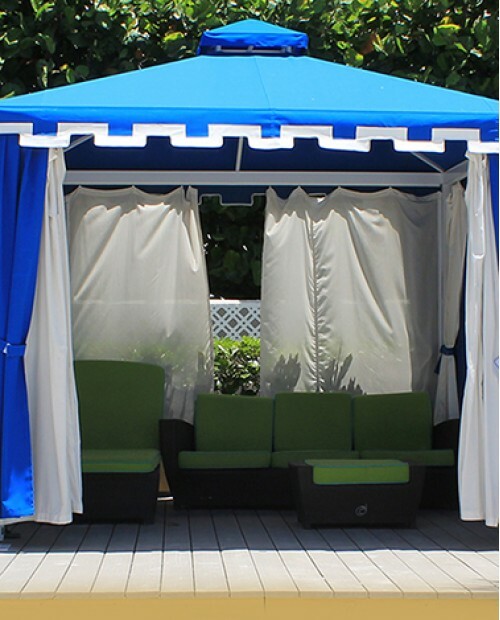 VIP Cabanas can accomodate up to 6 guests comfortably. Your payment of $250 today will be credited to your account upon arrival. Your group will utilize this account to savor items from our full menu of delicious refreshments from the SandBar and the Gulfside Grill. SandBox Cabanas are for guests of RumFish Beach Resort and TradeWinds Island Grand only. To make your reservations on this website you'll need your confirmation number. You can find your confirmation number on your resort confirmation email, it will resemble this: RDB5F7. We reserve the right to cancel any reservation that uses an invalid resort confirmation number.